As dimensional gates open in locations all over Arkham, the investigators must work to close or seal them. Before he can close a gate, an investigator must enter the gate, explore the Other World it leads to, and then return to Arkham. When an investigator returns from an Other World, as described earlier, the player should place an explored marker under his investigator marker. This gives the investigator an opportunity to destroy and close the gate during the next Arkham Encounters Phase. If the investigator leaves the gate's location for any reason, the player must discard the explored marker - the investigator has missed his opportunity and must explore the gate again if he wishes to close it. If, during the Arkham Encounters Phase, an investigator is on a location that contains an open gate and that investigator has acquired the explored marker, he may now attempt to close the gate. To do so, the investigator must choose whether to make a Lore check or a Fight check, using the number printed on the gate marker as the modifier. If the investigator succeeds at this check, he closes the gate and takes the gate marker as a gate trophy. If the investigator fails, the gate remains open. The investigator can try to close it during the Arkham Encounters Phase next turn (and in subsequent turns, as long as he does not leave the gate location). 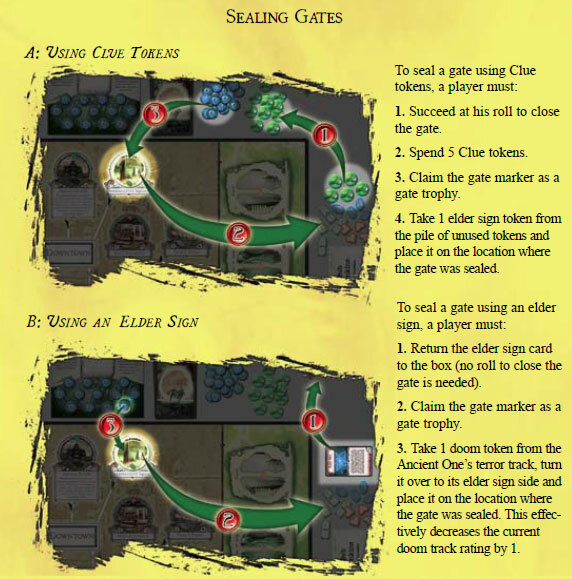 If an investigator successfully closes a gate, he may immediately spend five Clue tokens to permanently seal it. The player takes a doom token from the pile of unused doom tokens, turns it over to its elder sign side, and places the token on the gate location. The player still claims the gate marker as a trophy. The gate is now sealed: No further gates can open and no monsters can appear at the location of the sealed gate for the remainder of the game. When a gate is closed, all monsters in Arkham, the Sky, and the Outskirts that have the same dimension symbol as the closed or sealed gate are removed from the board and returned to the cup. A monster's dimension symbol is printed in the lower-right corner of the marker's movement side. The player removes 1 Sanity and 1 Stamina from his investigator sheet. This may knock the investigator unconscious or drive him insane, but the elder sign still takes effect. The player takes a doom token from the Ancient One's doom track (not the pile of unused doom tokens), turns it to its elder sign side, and places it on the location to be sealed. This effectively lowers the current doom level of the game by 1, and this is one of the only ways to do so. The player then returns the elder sign card to the box. This specific card cannot be drawn or used again this game. Once these actions have been taken, the gate is now sealed: No further gates can open and no monsters can appear at the location of the sealed gate for the remainder of the game. During the turn he returns to Arkham from an Other World, an investigator does not have to evade or fight any monsters in the gate's location. 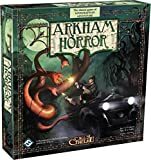 This rule only applies during the turn he returns to Arkham; in subsequent turns, if the investigator remains in the location, he must evade or fight any monsters there as normal.